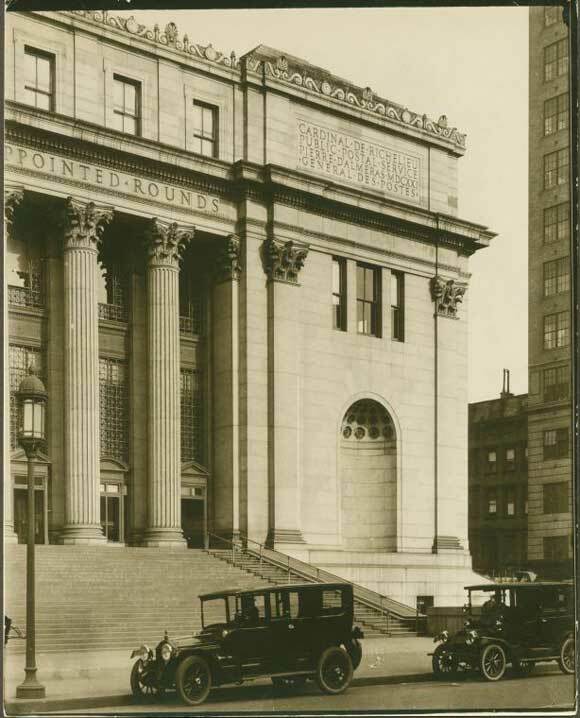 Today, in honor of New York Fashion Week's move to Moynihan Station, our 34th Street archivist Anne Kumer shares some history of the building also known as Farley Post Office. This post also appears on NYC Circa. 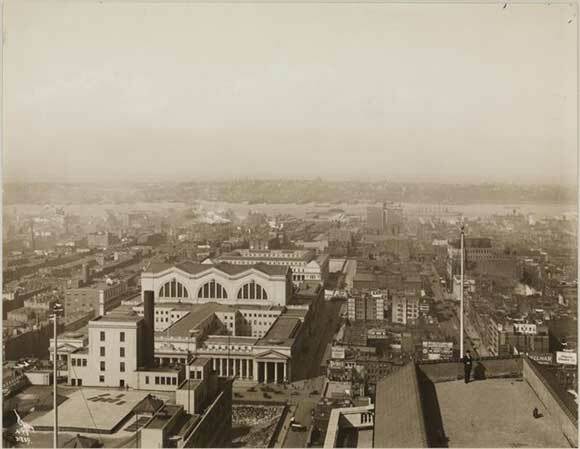 In the early 1900s, much of Midtown Manhattan west of Seventh Avenue was residential. Situated between the city's dirty ports and arguably just as dirty as the Tenderloin district, the area was home to low income families and the generally disenfranchised. Developers saw it as the perfect location for a new railway station that would connect Manhattan to the state of Pennsylvania. They purchased property, and most of the residents were pushed out of the area and into neighborhoods farther north. When Penn Station was built in 1910, it brought commuters, pleasure seekers, and commerce straight into Manhattan from across the Hudson river and farther west. 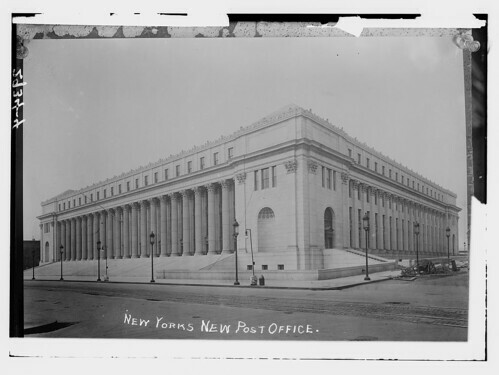 The Farley Post Office building, then known as the Pennsylvania Terminal Building, just to the west, was built right after completion of Pennsylvania Station, and opened to the public in September, 1914. Both buildings were designed and built by McKim, Mead &White, and both played a significant role in turning the neighborhood from residential to commercial. The quote comes from Herodotus' Histories 8.98, and refers to Angarum, the royal riding post in the Persian Empire. Schnapp had previous experience carving, having completed the front facade of the New York Public Library in 1911 when he was just 19 years old. 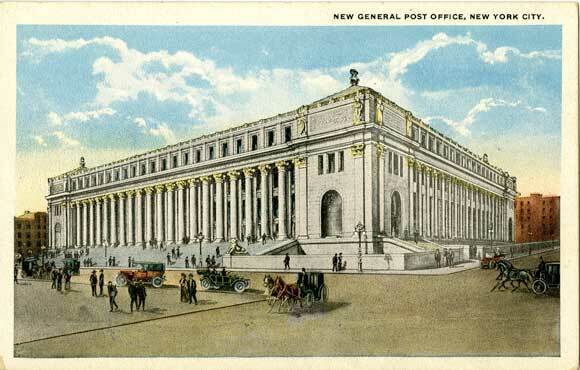 Around 1918, Penn Terminal was renamed General Post Office Building. In 1933, President Franklin Delano Roosevelt appointed James A. Farley as the 53rd Postmaster General. Under Farley's leadership, a western annex was added onto the existing building in 1934, and The General Post Office building was extended all the way to Ninth Avenue, giving it superblock status. Farley served until 1940, successfully managing the postal service during the Great Depression, and greatly improving trans-continental mailing services. Now the site of the future Moynihan Station, the Farley building may soon be converted back into a functioning train station and civic center. The project has its own history dating back to the 1990s, when New York State Senator Patrick Moynihan first suggested the conversion. For now, it continues to adapt yet again, to the city's changing needs, as the new location for New York Fashion Week.